There are quite a few more on their way! I'll keep ya updated. Also I was working on some Nodniks packaging and when I deleted the character, some of my layers were locked - this is what was left over. Can you guess which character it was? 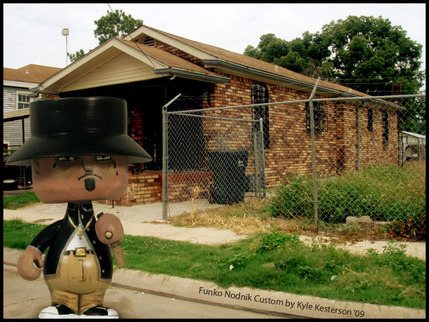 This is a custom painted Nodnik, from our new line of art vinyl here at Funko. Hop on over to Nodnik Nation and check out some of the other customs by some really talented artists! You can even get your own to do up and share. 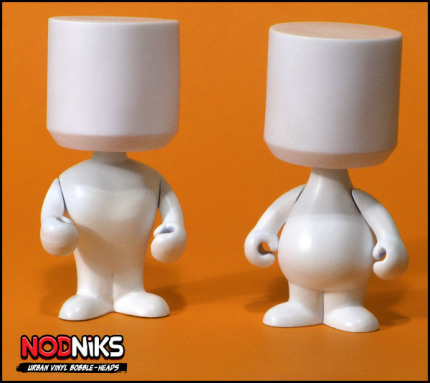 I've been working at Funko on this bobble-head toy line called "Nodniks" from its conception, and today, we finally received the molded blank plastics! It's been a long time coming, but we're all super excited about this line. We have some very cool community oriented projects in the works for these guys, so stay tuned!